Cathy’s Tuesday Tip: Go Monochromatic! ≈ Comments Off on Cathy’s Tuesday Tip: Go Monochromatic! 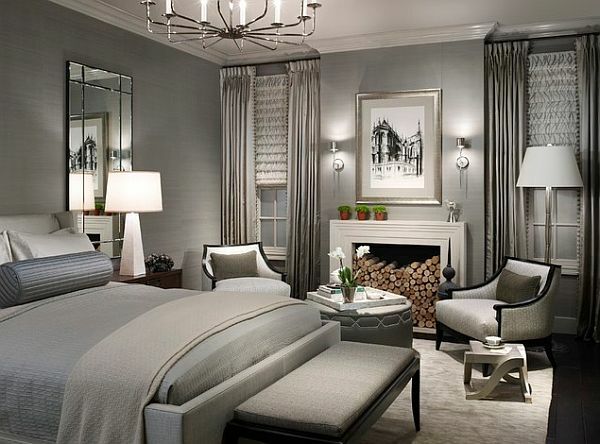 Contrary to popular belief, monochromatic design does not mean that everything in a room is the exact same color. A monochromatic color scheme actually incorporates many different shades of the same hue – adding a surprising amount of depth and intrigue! Fore more tips and design inspiration, visit http://www.cathyhobbs.com. 1. Embrace soft colors. While busy patterns and bold color schemes are stylish, they can be so visually stimulating that they may interfere with your ability to sleep. 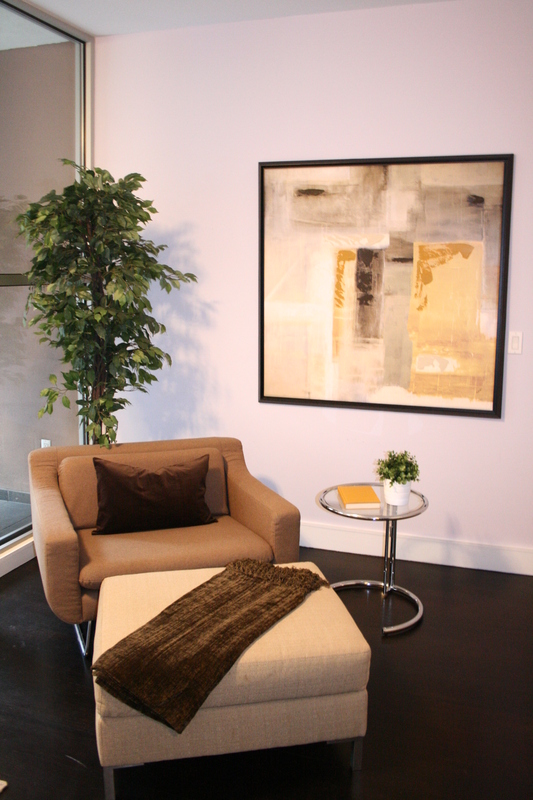 Cool colors such as soft blues, greens and purples have been said to promote tranquility and calmness. 2. Divide your room into sections. The bed should be the primary focus of the room, but if you’ve got the space to do so, also reserve a section near the closet for wardrobes and dressers, and another section for a sitting area or reading nook. Having a place to sit and unwind is a great way to relax before hopping into bed. 3. Remove distractions. Keeping your laptop on a desk in your bedroom is an easy way to invite stress in. If it’s out of sight, you won’t be as tempted to check those work e-mails while lying in bed. Remove anything that doesn’t maintain an air of peacefulness. Visit CathyHobbs.com for more design inspiration! Do you want to spice up your current home décor? Animal prints are the way to go! There are an infinite number of ways to use animal prints, and they add a wonderfully exotic accent to any room. The trick to incorporating animal prints into your décor is to treat them like a neutral. Thinking of laying a beige rug down on the bedroom floor? Try a zebra print instead! You could also try tossing your boring monochromatic throw pillows and replace them with a daring cheetah print instead. As you can see, there’s a number of ways to bring a little something wild into your home. If you don’t want to commit to large furniture or rugs, you can always pick up other little accents such as picture frames, trays, throws… the possibilities are endless! Also to personally follow me, you can become a FAN ofCathy Hobbs Interior Designer on FACEBOOK and FOLLOW Cathy Hobbs on Instagram and Twitter! If you are planning to sell your home and wondering how to best display your current rooms, I highly recommend getting neutral accents. Whether you have them already throughout your house or you plan on buying new pillows, bedding, accents etc. to help sell, neutral is the way to go. Take a look at these two beautifully styled bedrooms that are created with simple, easy ingredients! Here are the components that really make this room sellable. 2. Symmetrical alignment of pillows in different layers. This arrangement makes the bed seem untouched and pristine. 4. One or two bold pieces. Rug and paintings/artwork. 1. Green life. Having plants (real or fake) give the appearance of freshness and life! Makes the room extremely attractive. 3. An accent color. The yellow greenish pillows pick up accents from the plants and ties the room together. 4. Real light. The windows really open up the space and brighten it. If you do not have the ability to have real light, try to use as many lights in a sophisticated way to brighten up the room. If you found these tips helpful and want to find out where you can buy the actual pieces I’ve used in my home stagings, I recommend buying one of my affordable Design Recipes! Each recipe is only $3.00 and gives you ALL the tools and knowledge to make your room look fantastic! When it comes to selling a home, the sale still often hinges on kitchens and bathrooms. These spaces still remain at the top of a potential buyers list as far as level of importance. As for home sellers, when it comes time to sell your home, you may or may not want to spend the money to renovate. 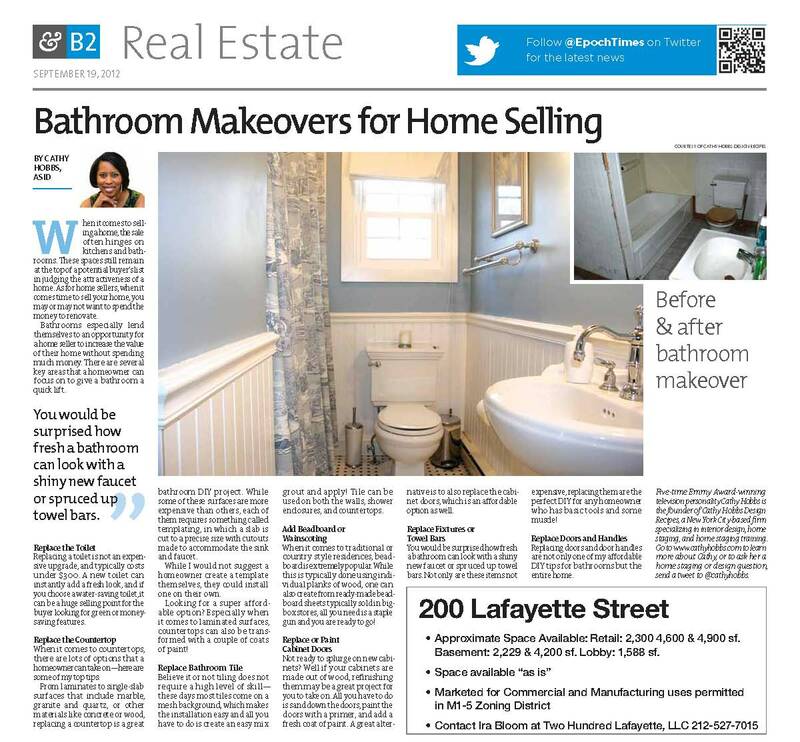 Bathrooms especially lend themselves to an opportunity for a home seller if he or she chooses, to perhaps take on a DIY project and in turn increase the value of their home without spending much money. There are several key areas that a homeowner can focus on to give a bathroom a quick uplift without spending a bundle. Replacing a toilet is not an expensive upgrade, and in fact is a upgrade that is typically under $300.00. I new toilet can instantly add a fresh look. There are lots of options that a home owner can take on – here are some of my top tips! From laminates to single-slab surfaces that include marble, granite and quartz, or other materials like concrete or wood, replacing a countertop is a great bathroom DIY project. While some of these surfaces are more expensive than others, each of them requires something called templating in which a slab is cut to a precise size with cutouts made to accommodate the sink and faucet. While I would not suggest a home owner create a template themselves, they could install one on their own. Looking for a super affordable option? Especially when it comes to laminated surfaces, countertops can also be transformed with a couple of coats of paint! Believe it or not tiling does not require a high level of skill—these days most tiles come on a mesh background which makes the installation easy and all you have to do is create an easy mix grout and apply! Tile can be used on both the walls, shower enclosures and countertops. When it comes to traditional or country style residences, bead board is extremely popular. While this is typically done using individual planks of wood, one can also create from ready made bead board sheets typically sold in big box stores, all you need is a staple gun and you are ready to go! No ready to splurge on new cabinets? Well if your cabinets are made out of wood, refinishing them may be a great project for you to take on! All you have to do is sand down the doors, paint the doors with a primer and add a fresh coat of paint! A great alternative is to also replace the cabinet doors, which is an affordable option as well. You would be surprised how shiny and fresh a bathroom can look with a shiny new faucet or spruced up towel bars. Not only are these items not expensive, replacing them are the perfect DIY for any homeowner who has a wrench and some muscle! Replacing doors and door handles are not only one of my affordable DIY tips for bathrooms but the entire home! Buyers only know what they see, not the way it’s going to be. It may be hard to believe but it’s true. Most buyers have a difficult time “imagining” what a space is going to look like. This is an important point to remember when it comes to staging and selling a property especially as it relates to vacant properties and empty spaces. Encouraging buyers to “envision” what a space might look like furnished was a design challenge a broker recently called me in to help solve. The dilemma was a familiar one. 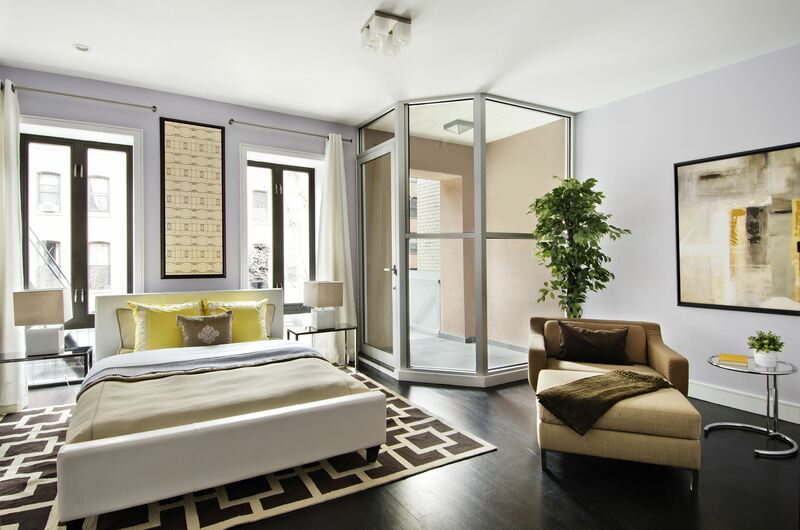 I arrived at 658 Bergen Street, a beautiful complex of condominium buildings in ProspectHeights, Brooklyn, and found myself in the middle of a stunning duplex apartment that was only partially staged. Another stager had staged the top level of the residence, but the lower level was completely bare and this was creating an obstacle when it came to selling. The marketing concept behind the duplex apartments was that the lower level could be used as a functioning space, perhaps a family room, office or children’s playroom. What I “saw” and what potential buyers found as well was a sprawling lower level, with white walls and beige floor tiles that felt more like an enormous storage locker or fun place for kids to skateboard than a functional space where anyone would want to spend any amount of time. 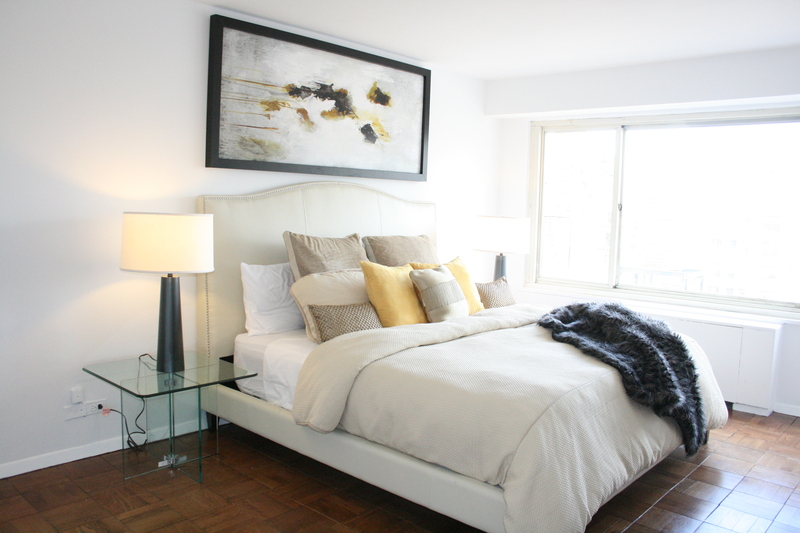 As a professional ASID Interior Designer and Certified Staging Professional residential interior design is my strength. New developments as well as executing functional designs from a blank canvas is indeed my distinctive niche. Relating to my design challenge at 658 Bergen Street, I was excited about creating a functional space from what many potential buyers had written off as “unusable”. I began my design process as I often do by requesting a floor plan in AutoCAD, which is an architectural based computer program used by professional interior designers and architects. I then began to space plan and immediately determining function, how the room will be used. I decided upon a “design recipe” that would create a sleeping suite/family area. Both spaces were distinctive, on the left the family room, on the right the sleeping area. The two spaces divided by a panel covered in gorgeous Asian inspired wallpaper from Osbourne & Little and silk panels hung on a stainless steel ceiling rod. My goal was to imply that there could easily be a division of space without in any way having the space feel closed off. I feel it’s so important for potential buyers to feel comfortable with space and dimension, having the sense that there is the potential to also “grow” within a space. At 658 Bergen Street, potential buyers were indeed attracted to the spaciousness, the open kitchen, living space on the upper level, the large master bedroom, but the interest stopped at the top of the staircase that led to the lower level. 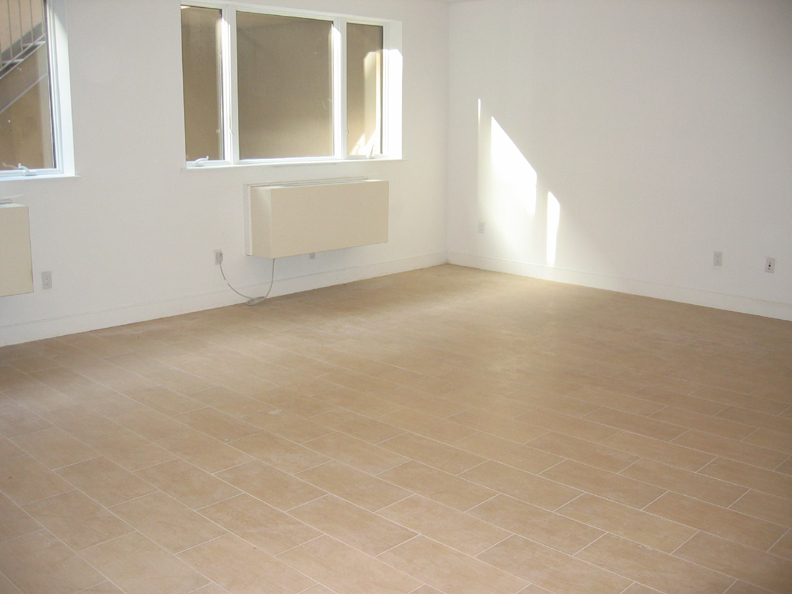 “The biggest challenge in this apartment is the large basement. The basement was cold and over-whelming. It was hard for the buyer to see what to do with the space. Considering half the square footage was in the basement, getting the price the developer wanted was not going to happen. Calling in an expert was the only way to go. Cathy was able to warm the space and show clear division of the space,” says Deborah Fuka of Prudential Douglas Elliman. In dividing the space into two functional areas, a sleeping suite and a family room, I also used different but complementing color palettes incorporating different accent walls within each space. 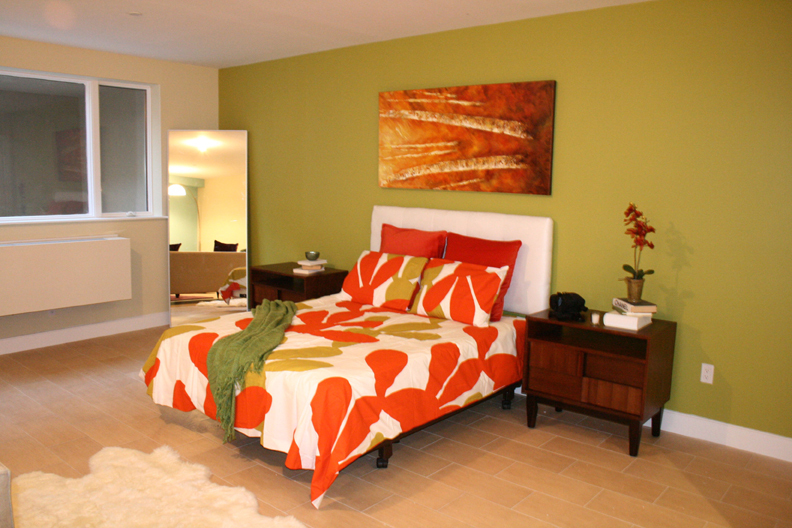 In the sleeping suite, I selected orange and lime as my color scheme, painting the accent wall a color called Jalapeno Pepper. 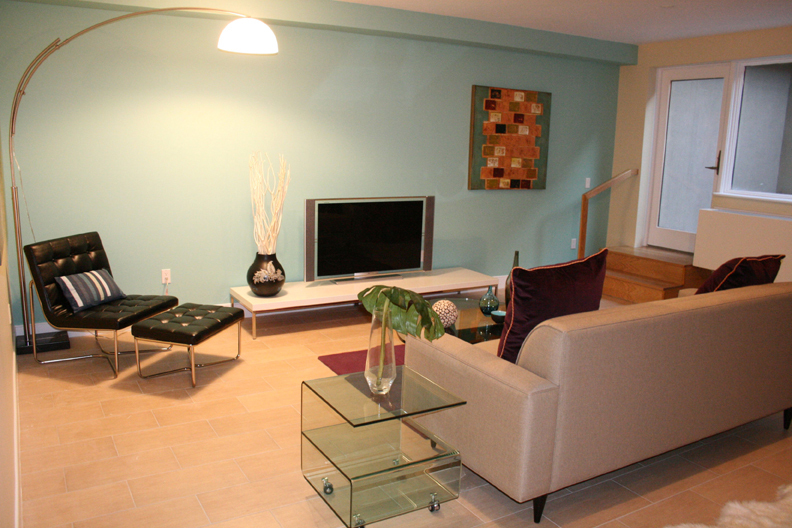 While in the family room area, I selected eggplant and orange, selecting a subtle turquoise for the accent wall. The result was two distinct spaces that blended perfectly. 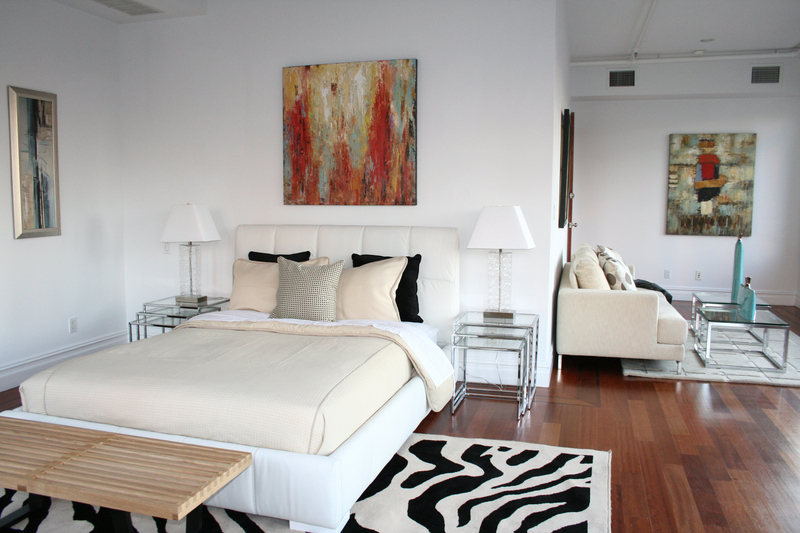 “The color pattern Cathy chose really helped make it look comfortable. The way she helped show a bed set and living room conquered the biggest challenge. I am confident that I will now get the price we are seeking,” added Deborah Fuka of Prudential Douglas Elliman. Before my re-design and staging, the duplex apartment had lingered on the market for months, with no offers. Within a short time after my staging, the developer was presented with offers not only for the unit that I staged but also for similar units within the building. The goal with any staging is to allow buyers to see a properties true potential. What this means for many buyers is literally “seeing is believing”. As an interior designer and home stager who has helped to sell more than $500 million dollars worth of real estate, I understand real estate and the nuisances that come with designing spaces that allow potential buyers to envision themselves within a space. With this design challenge, my design recipe was to define the space for them, showcasing the lower level as a space that could be used for a specific function. 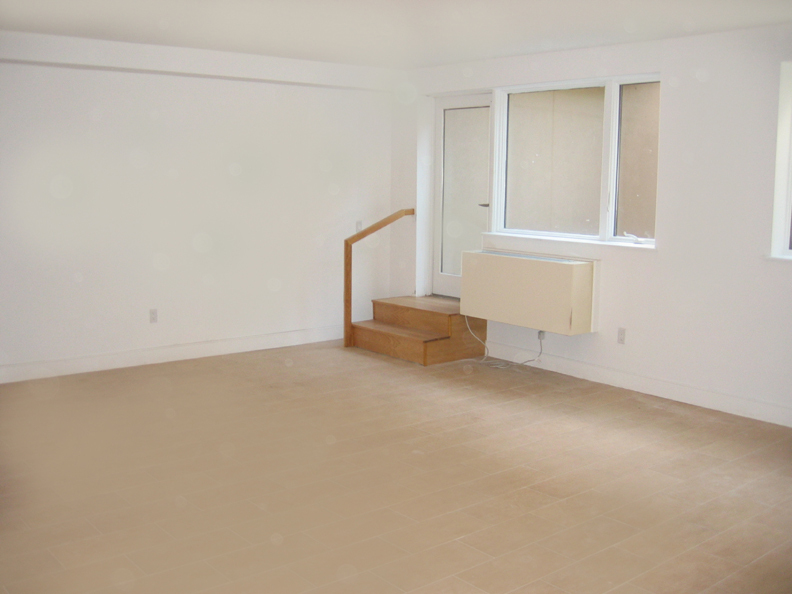 When the lower level was a blank canvas, it was difficult for buyers to imagine the potential, once the space was stage they could clearly visualize how the space could be used first hand. The design principles I used in executing this design, can also apply to other unique or hard to design spaces. When faced with design challenges like basements and lower levels, remember it’s all about “design, function, and enticing buyers”. REDBOOK MAGAZINE Profiles Celebrity Interior Designer Cathy Hobbs, ASID, CSP in January Issue. Cathy Shares Ideas For Bringing The Color Blue Into The Bedroom! ≈ Comments Off on REDBOOK MAGAZINE Profiles Celebrity Interior Designer Cathy Hobbs, ASID, CSP in January Issue. 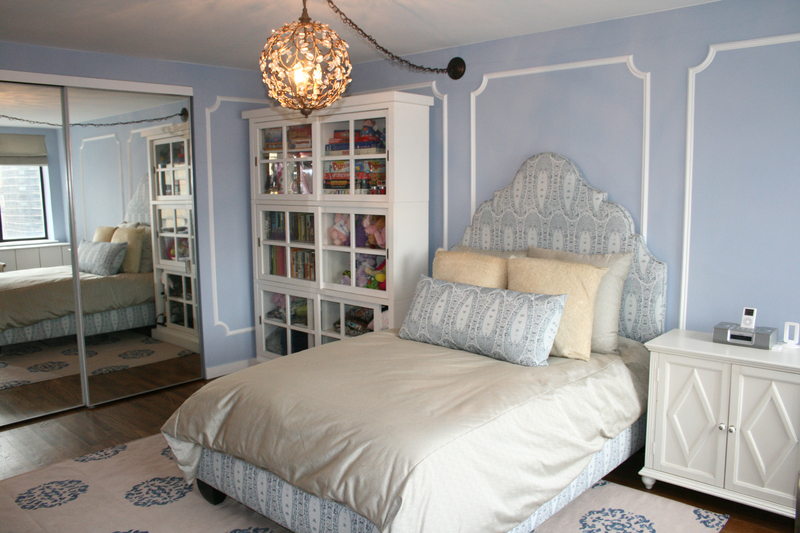 Cathy Shares Ideas For Bringing The Color Blue Into The Bedroom! Not sure what it is about blue these days, but in the last month, I have been contacted by two different publications who were looking for me to share my thoughts about how to incorporate the color blue into interior design. 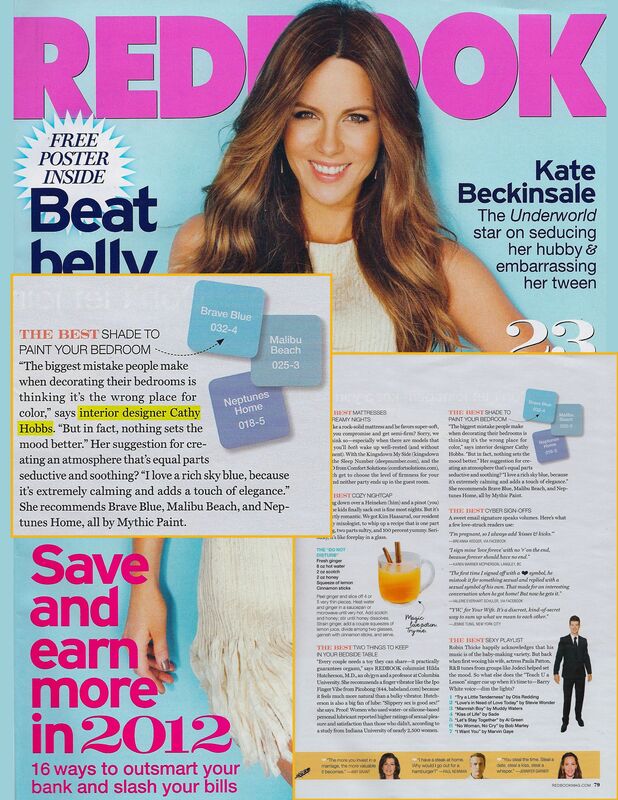 REDBOOK magazine, just published in its JANUARY ISSUE on news stands today, my ideas for incorporating blue into the bedroom! 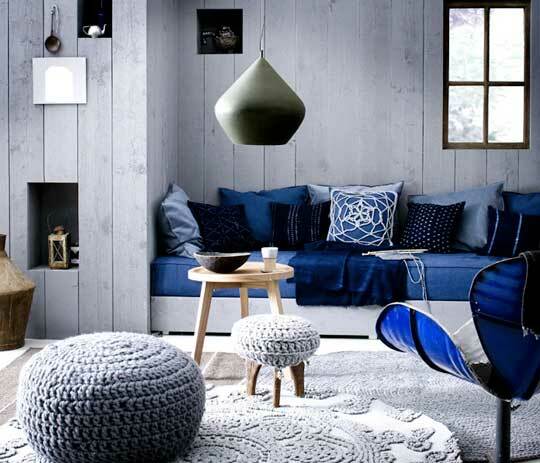 When it comes to interior design, blue remains one of the most popular and one of the most universal. As an interior designer, what I love most about using blue is that like a great black dress, I can “dress it up or dress it down”. Moreover, because blue comes in so many different shades, tones, tints and colors, I feel I can pair it with so many different colors ranging from red to chocolate. When it comes to my clients, however I feel that clients are often afraid to take the plunge! Color can be scary and often when it comes to such a bold color as blue, people are afraid to incorporate such a strong color into their décor. I believe blue can be used virtually anywhere, from bathrooms to bedrooms and even kitchens. I also love using blue in different ways from paint colors, upholstered furniture pieces and accents.